Hooray! Back in the saddle again! 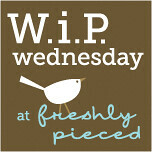 It's a long time since I've been able to link up with WIP Wednesday! Yea - both projects are going to be beautiful and love the look of those Oakshott leaves!! Your Christmas bunting is looking very cute but oh, those Oakshott leaves! They will be stunning, and its a fabulous idea. Gorgeous! The bunting looks perfect and I can't wait to see more of those Oakshott leaves! Oh that bunting is goign to look great - is taht the plan to use the selvedge edges in the leaves? it looks great with the fried eges that have just one colour - or is that just a coincidence (now that took me some 5 minutes to remember that word, I constatnly came up with accident ...). Welcome back! I was just thinking the same thing. The frayed edges would look amazing. Look forward to seeing the finished quilt. The christmas bunting will be so cute too. Maybe another thing to add to my ever growing list of things to make for Christmas. you had me at oakshott! Oooh! Looking lovely! Sometimes all it takes is a fabric purchase! I've had my eye on Oakshott too, but haven't forked out yet...look forward to seeing this one develop. Oh - I don't know if I'm psychic, but I think your Oakshott quilt is going to be stunning! I agree with others here- the Oakshott leaves are going to look good! and with frayed edges! Love the design of your new quilt. It is going to look stunning.